One of the worst things for pool owners in the sweltering summer months is going out for a swim to cool down and enjoy time with friends and family, only to find a critter has made it into their splash-zone and couldn’t find a way out. In an effort to save local animals, the FrogLog offers a simple escape route for small creatures who might otherwise drown in a pool. So, how does it work exactly? Adhere it to the side of the pool, where animals such as mice, squirrels and frogs have a tendency to swim as they try to escape, and the mesh netting surrounding the FrogLog will allow them to climb up to dry land. No guidance is needed — the animals will circle the edge of the pool and happen upon the FrogLog themselves. The ramp allows them to scurry or hop — whatever their style — out of the pool instead of drowning. The FrogLog is effective in saving reptiles and amphibians such as frogs, turtles and lizards; mammals such as rabbits, chipmunks and squirrels; and birds and baby ducklings among many other small creatures. Since wildlife biologist Rich Mason started the project 14 years ago, the FrogLog has saved more than one million animals. Efficient and compact, only one FrogLog is needed for a pool measuring 15 feet by 30 feet. If you choose to run your pump and filter at night, keep your chlorine levels high, have multiple skimmers or just happen to have a super luxurious mega-pool sitting in your backyard, you may need an extra FrogLog or two. 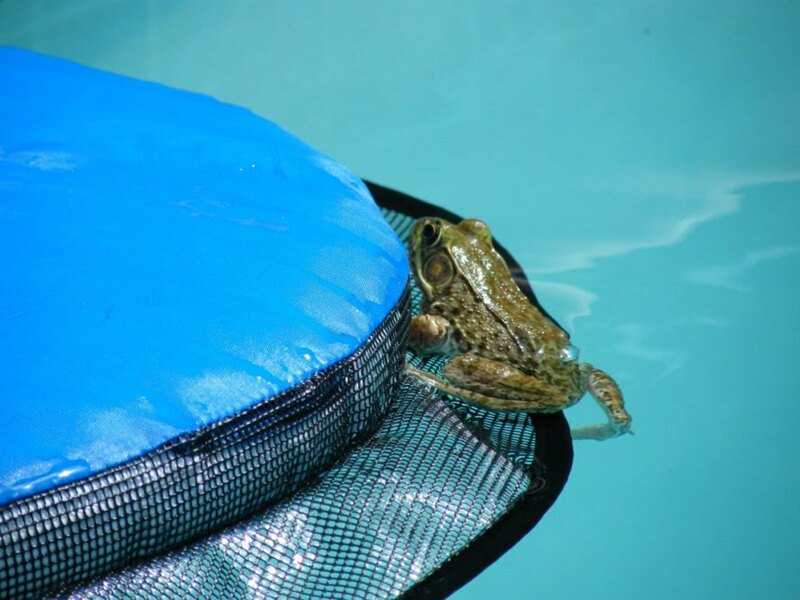 Not to worry, though; the FrogLog, available for purchase at froglog.us, is a no-brainer decision in keeping your pool clean, reducing maintenance and rescuing native animals in style. Swimming pools can be dangerous for small animals like frogs. The FrogLog aims to provide an easy rescue system for these creatures should they accidentally find themselves in a pool. Small creatures often swim around the edge of a pool looking for a way out. With a FrogLog, they can bump into the mesh edge and easily climb up and out of the pool to safety. The FrogLog has already saved more than a million animals from drowning since its launch in 2004.